Thailand and Myanmar are an alluring maze of pretty islands popping out of impossibly clear water. The lush, dense interiors of these landmasses are often home to ancient cultures and significant archaeological sites. For superyachts, these nations offer the opportunity to escape the crowds, to seek out an isolated corner of paradise where nature abounds. Diving in the Andaman Sea is always richly rewarded. The thriving reefs here house staggeringly biodiverse marine populations. There is a flourishing yachting hub in Phuket, which makes for the ideal jumping-off point to the Andaman Sea in the Bay of Bengal. Allow Dive Butler to guide you as you explore the pristine, remote beauty of the region and discover a side to the country few will ever get the chance to see. 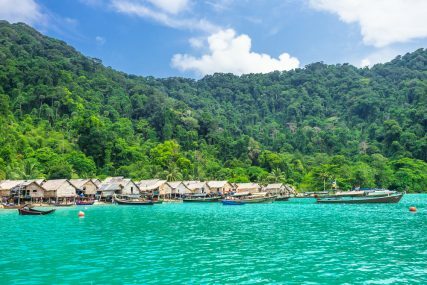 As part of our guide to diving in Thailand and Myanmar, we head west to the Andaman Sea to take a look at what awaits superyacht divers. It’s hard to decide whether Thailand’s islands are more beautiful from above or below the surface of the azure sea. Thankfully, superyacht guests won’t have to choose. Embark on a bespoke diving odyssey from Phuket and Dive Butler will whisk you off to the unspoiled corals of the Similan Islands, the little-dived isles of the Surin National Park and the southern Koh Racha or Koh Haa islands. The Similan Islands make a natural first stop. These 11 protected islands, with their boulder-strewn white-sand beaches, are among the country’s premier diving destinations. The Similan Islands Marine Park protects some of the most bountiful reefs in the world, where schools of fish hundreds strong swarm over the healthy corals. Divers can channel their inner Cousteau as they explore granite swim-throughs, tunnels and caverns guided by an experienced and knowledgeable dive butler. At just 65 miles north-west of Phuket, the Similan Islands don’t take long to get to. And with 29°C waters, 30 metres of visibility and the chance to see whale sharks, turtles, manta rays, leopard sharks, and black and white tip reef sharks the trip is a must for any superyacht itinerary. Allow Dive Butler to craft your route and we will guide you away from the most popular Similan spots to discover uninhabited islands, secret dive sites and guaranteed big fish sightings. 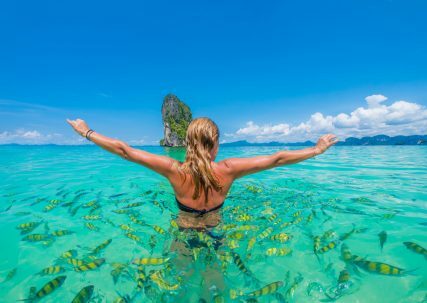 The islands of Koh Tachai and Koh Bon are home to vast schools of barracuda and tuna, Bluefin trevally and fusiliers, as well as the tiniest of nudibranchs. Rarely visited, these islands offer more challenging conditions to the southern Similan Islands. However, with the local knowledge and the right permits, they reveal a fascinating underwater landscape of hard corals and boulders frequented by soaring manta rays and sharks. Further north, the Surin National Park is a kaleidoscopic swirl of soft corals, anemones, barrel sponges and sea fans. Pinnacles rise from the depths to just poke their tips through the surface. Keen-eyed divers will spy rarely spotted species such as ghost pipefish, harlequin shrimps and delicate seahorses as well as huge groupers, barracuda and mantas. 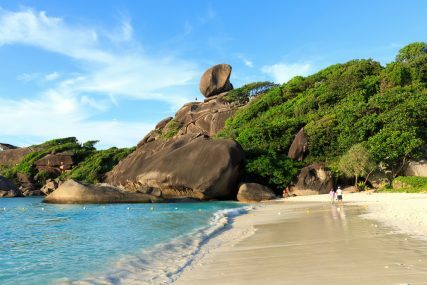 South of Phuket and a short sail from the mainland, the twin islands of Koh Racha are a quieter and more leisurely alternative to the popular Phi Phi Islands. Non-divers can laze away days in hidden coves overhung by swaying palms, while divers can take on strong currents which bring with them a bounty of marine life. The twin islands of Koh Rok nestle in the Mu Koh Lanta National Park, separated by a channel. Adorned with soft and hard corals, this rainbow of colour and life is just as easily snorkelled as it is dived. Just poking out of the crystal-clear seas are the five isles of Koh Haa, a perfect superyacht destination due to their private cove, accessible only at low tide. There are shallow caverns, pretty coral gardens and high walls frequented by grey reef and leopard sharks. Schools of barracuda, reef sharks and trevally are drawn by the soft corals. Some 20 miles (32 kilometres) away, a pair of hidden pinnacles begs to be discovered. This is a big pelagic country, with manta rays and whale sharks frequently sighted. Head still further south to the Tarutao National Park, a stone’s throw from the coast of Malaysia. Its islets are scattered like lily pads across 25 miles (40 kilometres) of the ocean, offering some of the most untouched, virgin diving in the world. Pinnacles and walls display a wealth of marine life sure to linger in the memories of all on board. 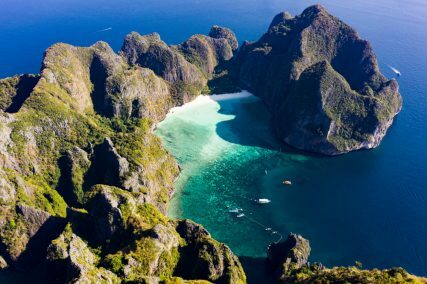 The world-famous Phi Phi Islands, with their stunning limestone cliffs, is always a winning choice for superyachts and divers. Yet southern Thailand’s coast is dotted with tropical paradises far from the crowds, each one ringed with a perfect sandy ribbon. Dive Butler works alongside some of the most experienced and respected names in the industry, a team which knows Thailand’s waters like few others. Together we craft totally personalized itineraries infused with insider knowledge, inspiration and adventure. Simply relax and let Dive Butler guide, entertain and enrapture, as you uncover Thailand’s best-kept diving secrets. A Map of the Ocean: a Quest of Discovery, or an Open Door to Exploitation?